/Archive / Virtual Private Server (VPS) / What is backup? Backup is a reserve copy of the data, from which the original data can be restored. Backups are usually done so that in case the working copy is lost, it can be restored. Good backup must be on a different drive from the working copy. In a perfect world — on a completely different PC or even on the cloud drive. In that case, even if the machine that runs the working copy is down, you still have a version of data that can be used to restore it. Backing up the whole system is preferable to backing up the part of it. Even if right now all you need is this part. All the old backups have to stay preserved as long as possible. At any moment, you should be able to restore not only the most recent backup, but also an older one. Unihost keeps automatic daily backups for 14 days. 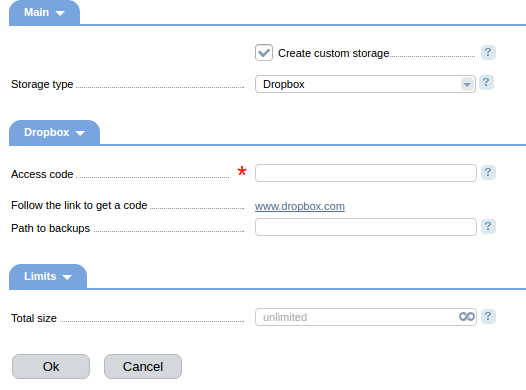 But you can make a backup yourself via the admin panel. Under Files click on Backup. Choose what you want to save and click on the corresponding button. A backup copy will be available to download after processing, as well as sent to you by email. Under Tools select Backup copies. Enter the access code and provide the path to backups. Click ОК. Now each day, at 00:00 a backup will be created in the corresponding folder.